The pace of growth will pick up to above 4% in the medium term. Consumption as well as public and private investment will provide a new impetus to growth. The external sector will be characterised by a further widening of the trade deficit. 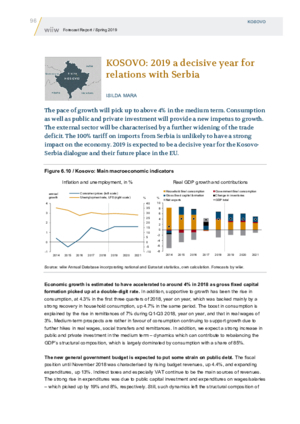 The 100% tariff on imports from Serbia is unlikely to have a strong impact on the economy. 2019 is expected to be a decisive year for the Kosovo-Serbia dialogue and their future place in the EU.